Japan launched a cargo ship Friday bound for the International Space Station, carrying a 'space junk' collector that was made with the help of a fishnet company. The vessel, dubbed "Kounotori" (stork in Japanese), blasted off from the southern island of Tanegashima just before 10:27 pm local time (1327 GMT) attached to an H-IIB rocket. 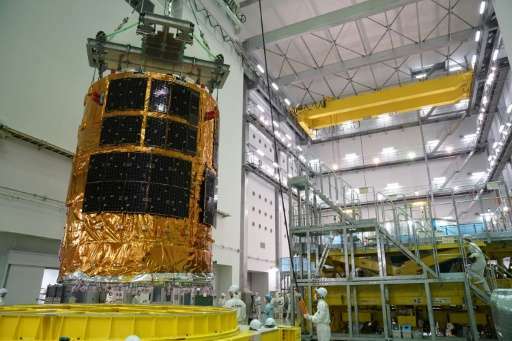 Scientists at the Japan Aerospace Exploration Agency (JAXA) are experimenting with a tether to pull junk out of orbit around Earth, clearing up tonnes of space clutter including cast-off equipment from old satellites and pieces of rocket. The launch was successful as "the satellite was removed from the rocket" and put into the planned orbit about 15 minutes after the liftoff, JAXA spokesman Nobuyoshi Fujimoto on Tanegashima told AFP. More than 50 years of human space exploration since the Soviet-launched Sputnik satellite in 1957 has produced this hazardous belt of orbiting debris. There are estimated to be more than 100 million pieces in orbit, posing a growing threat to future space exploration, scientists say. Researchers are using a so-called electrodynamic tether made from thin wires of stainless steel and aluminium. The idea is that one end of the strip will be attached to debris which can damage working equipment—there are hundreds of collisions every year. The electricity generated by the tether as it swings through the Earth's magnetic field is expected to have a slowing effect on the space junk, which should, scientists say, pull it into a lower and lower orbit. Eventually the detritus will enter the Earth's atmosphere, burning up harmlessly long before it has a chance to crash to the planet's surface. JAXA worked on the project with Japanese fishnet manufacturer Nitto Seimo to develop the cord, which has been about 10 years in the making. "The tether uses our fishnet plaiting technology, but it was really tough to intertwine the very thin materials," company engineer Katsuya Suzuki told AFP. "The length of the tether this time is 700 metre (2,300 feet), but eventually it's going to need to be 5,000 to 10,000 metre-long to slow down the targeted space junk," he added. Previous experiments using a tether have been done in recent years. Another spokesman for the space agency has said it hopes to put the junk collection system into more regular use by the middle of the next decade. "If we are successful in this trial, the next step will be another test attaching one tip of the tether to a targeted object," he added. The cargo ship launched Friday is also carrying other materials for the ISS including batteries and drinking water for the astronauts living there. Good. 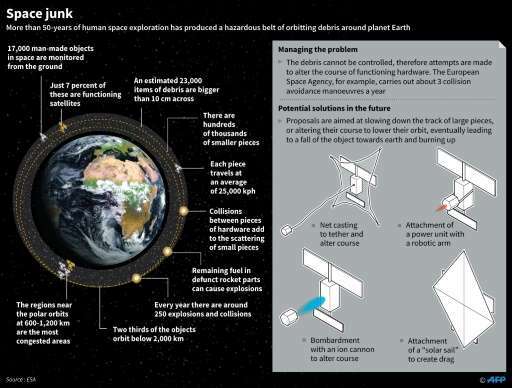 A solution to the space junk problem is well thought. I hope it works spectacularly. Is this intended to clear just the one piece it is attached to or does the static field extend to the general area allowing other bits to be pulled down? Glad to see some efforts coming before a catistrophic event. This article doesn't explain very well how this is supposed to work. That the next step if some test is successful to "test attaching one tip of the tether to a targeted object" suggests this test won't even collect any space junk, and may just add it as junk. If the idea is one net per object, that's a lot of net and material itself considering the article states there are 100 million pieces of junk in space, which seems too high considering the number of times we've actually had a rocket go into space. And finally, given that a lot of junk is traveling at very high speeds, how will a net survive? Seems unlikely. I'd think using lasers to slow items down so they fall to the earth is a better approach. @ Da Schneib-Skippy. How you are? I have missed you. This might be stupid question, so it's okay if I get a slap for it. But what if the "space junk" being collected belongs to some country that don't want it scooped up? Maybe it is broken and does not work anymore, but still has stuff in it that the country might want to keep a secret? It would seem that these tethers are to be attached to each object to be de-orbited. While this is happening, seems like it will make the objects much more hazardous. Instead of a "point" hazard, each object will be like a flying blade, 5000 to 10000 meters long, cutting a very wide swath along its orbit. I hope this or other tech can be developed to get debris down. I still have this (probably impractical) vision of a robotic solar powered ion drive craft that would chase down space debris, grapple it and drag it to a low orbit. It could refuel by chewing metal reaction mass off of the targeted debris. Better to create an electric large magnet with a long magnetized pole (~75 meters) and lightning speed ejector. Collect enough junk, anticipate when the pole will point to earth and eject at lightning speed while turning magnet off. No need for trust to point to earth, it has all the time in the world. Fast CPU + Fast state of the art ejector. Rinse and Repeat. Eventually, the instrument will itself fall back to earth, where it can be refurbished and service anew.